An in-store digital strategy can be deployed with immediate a benefits for nearly all bricks and mortar retailers and is at the center of an Omni Channel CRM strategy. Influencing retail customers by getting inside their minds during their buying journey represents an ongoing challenge for marketers. However, as technology evolves, retail marketers who take advantage of sophisticated data mining on consumer preferences, timing and other key buying factors are making progress in the way they engage consumers. How do you measure the relationship between digital usage, traffic, sales and customer experience in your store? How significant is it? The Deloitte survey indicates that 84 percent of shoppers used some type of digital device for shopping-related activities before or during their most recent store trip. Measuring the impact of tactics deployed should therefore encompass a number of areas from merchandising to sales and to loyalty. A great digital experience has the biggest impact when used both before and during the shopping experience. It can make all the difference between converting to a sale or not. In fact, conversions increase 40 percent when customers use digital before and during shopping in-store. An effective digital experience has to be pertinent to the moment – whether at home or in the shopping aisle. The more the digital experience and information match the shopper’s needs at a given moment, the more likely she is to buy and the higher the conversion rate. The goal is to deliver a consistent experience across devices, before, during and after the shopping journey. Different platforms, content and lack of targeting will only serve to increase the divide between digital and in-store customer experience. Additionally, measuring the investment in digital only on the basis of incremental sales often results in using digital channels as a promo vehicle and in ‘cannibalization’. The need is for providing a personalized shopping experience with greater impact across all touch points, with a special focus on bridging the digital world with the in-store physical experience by breaking down the communication barriers. In order to realize this, the physical store must be integrated into the digital experience with tactics that are deployed to on-board customers in an effortless and seamless manner. On-boarding customers starts with identifying customers during the shopper journey, otherwise the divide between the digital world and physical worlds remains or even widens. For the purposes of this paper, we proceed with the assumption that WIFI penetration is significantly higher than customers downloading and using a client app. Recent studies show that US retailers have over 40% of their customers using their WIFI network, a percentage 5 to 10 times greater than customers who download and actively use the retailer’s client app. On-boarding customers by registering them on the WIFI network is the easiest of all the possible alternatives and will further accelerate as IPV6 gets penetration and enables to automatically match a customer online with the same customer in the store. Creating an interactive digital environment in a retail store requires signing up customers to the retailer’s Free WIFI network, which includes opt-in and accepting to receive messages from the retailer. Once the customer is registered on the network, then it becomes easy to connect the customer to a variety of valuable information sources (e.g. loyalty data) and to communicate across multiple channels (e.g. Facebook). The more data sources about the customer get consolidated, the more we are able to identify the customer’s interests and shopping patterns and deliver highly relevant and contextual communications. There is a range of proven tactics that are utilized in combination to get customers to register on the retailer’s Free WIFI. In certain locations such as shopping malls, providing Free WIFI access to shoppers who have a high dwell time is a known tactic that captures customers both in the store and nearby the store. By setting up multiple SSID’s (networks), the retailer increases the chance of shoppers using one of their networks instead of competitor networks and is in a position to offer deals to shoppers who register. POS material announcing digital deals plays an important role when placed at strategic locations in the store where purchase decisions are made. For example, in an apparel store, POS material promoting digital deals in changing rooms will obtain a greater number of log ins than when displayed in a walk through area. Other examples such digital deal signage at cash terminals and POS on the product shelf that indicating a deal, all have impact when customers see they can receive a discount on a purchase. POS material have high impact and log-ins if positioned where purchase decisions are made. High tech marketing applications such as SMI can send out digital coupons to mobile phones (e.g. QR codes, Bar Codes) that are unique to each customer. When a customer obtains the coupon, it is embedded with both the product code and a unique identifier that associated to the phone’s MAC address. As a result, after the cash terminal scanner has read the coupon, the basket and customer ID (if a loyalty card was used) gets linked to the device where the coupon was placed. In the above example, a customer was registered on the network without having to enter his information in a form. Shopping journey analytics can reveal which journeys are the ones that are most likely to end up in a purchase.For example, the highest probability for a purchase may start with a visit to Women’s footwear followed by the Children’s department and then the Discounted goods area. As another example, cashiers inform customers that there are digital deals if they log into the network. Having employees interact with customers on a purchase journey at targeted locations and then inviting them to connect to the network in order to get a deal, is an effective way to register customers. Communications that start on a digital medium is a very natural way to get customers to think digital on an upcoming store visit. 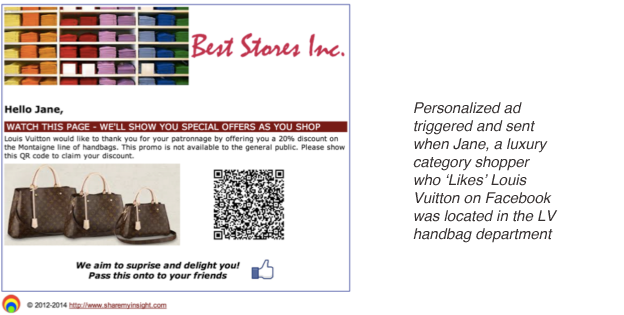 Using Facebook and other social media to deliver personalized and relevant deals that can be used on the next store visit is another way to register customers on the retailer’s network. One of the best methods to do this is to provide a coupon on Facebook that can be downloaded to the customer’s phone and swiped at the cash terminal to identify the customer (as previously described). Using the current member list and communication channels to message members, the retailer announces the new digital channel and sends a link to download a coupon that is used on the next store visit. As previously described, the coupon serves as the mean to link the device ID (MAC address) to the loyalty ID when the coupon is scanned at the cash terminal. Using the retailer’s e-Shop web pages, a digital coupon is embedded for selected products with a discount offer when redeemed at the store on the next store visit. In addition to serving as a means to register customers when at the store, the online coupon is valuable for driving online business to the physical environment and as part of a designed strategy that prevents the eShop from cannibalizing store sales. By using targeted communications to the customer’s interests, ads are personalized and relevant to the customer. A retailer marketing department will limit the number of messages sent to customers in order to not risk negative feedback. In a typical example of an SMS or Email campaign, a Click Through Rate is typically around 2%, due to a low relevancy score. When messages are delivered during the shopper journey and by location to products,the relevance score is much higher as can be seen in the table below where a CTR rate can reach 25%. Therefore, shopper journey ads can have a 4 times greater customer reach factor than a traditional media channel approach for reaching customers. Conversion Rates are seen as having 2-5 times higher rates in test cases, depending on factors such as the retail sector (e.g. grocery, apparel, electronics), the frequency of visits, whether a CRM/loyalty program already exists and the retailer’s current marketing capabilities. The most significant factor however is relevancy based on the shopper journey and proximity to products that are regularly shopped. Therefore, shopper journey ads can have a 4-5 times greater number of conversions over a traditional media channel approach. A significant factor in cost of communications is that the in-store channel belongs to the retailer and there is no need to buy media from a 3rd party at the highest bid price. Another factor, as already mentioned, is the higher rate of conversions that reduces the overall cost of conversion. In contrast, an in-store digital media channel doesn’t compete with other media buyers and has a cost of $.24 per CPC, approx. 6 times less. By converting at a higher rate of 5% and in some cases as high as 10%, the overall cost of conversion becomes significantly less expensive – as low as 10% of the cost of 3rd party media channels. A retailer’s investment into developing an in-store digital strategy produces tangible results in only 3 to 6 months and can be deployed in a test environment to validate results before rolling out further. In summary, immediate and long term benefits are within reach of nearly all bricks and mortar retailers and should be at the center of any Omni Channel CRM strategy. ← Are retailers drowning in insight?